Bayonet Thermocouples (IB) have a grounded junction to reduce response times and increase accuracy. These sensors may be mounted with a quick release twist lock mount for easy changeability. If you require very fast, highly accurate measurements - see our line of needle sensors. These sensors are also available in RTD Elements. 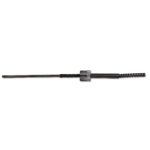 This Bayonet Style Sensor comes standard with a 241" long unterminated Stainless Steel over braid over glass or 1" terminated spiral lock over glass.